Crossing the Golfo Dolce from the typical Costa Rican town of Golfito, dolphins jump in the glowing green water alongside passenger ferries. The small harbor of Puerto Jimenez emerges in the distance as fishermen cast their reels from the dock. 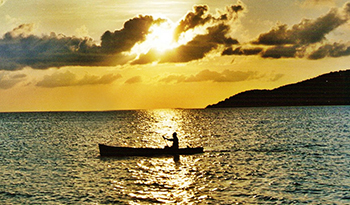 Small, locally owned restaurants serve seafood along the quiet harbor. A dusty road leads into the town scattered with local food vendors and expat owned cafes. Scarlet Macaws and Toucans swoop across the jungle canopy in the distance. There’s no doubt about it, Puerto Jimenez is full of small town Tico charm. Yet what brings most people to this remote part of Costa Rica is the Corcovado National Park, described by National Geographic as the “most biologically intense place on Earth in terms of biodiversity.” Surrounded by some of the most stunning nature in the entire country, Puerto Jimenez is an ideal home base for outdoor lovers. Real Estate in Puerto Jimenez is diverse, with simple lodgings around town and luxurious properties deeper into the forest. There are many undeveloped lots in wilderness for those interested in building a home. 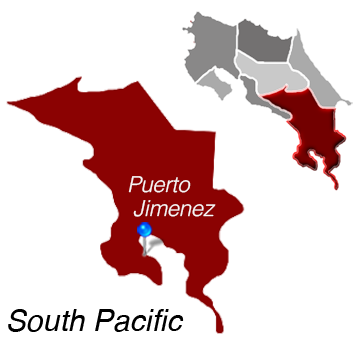 Puerto Jimenez is Located in the South Pacific.